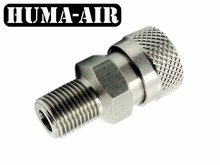 Microbore fill hose for filling your PCP airgun. Working pressure 400 bar. 1/8 bsp female treaded couplers on both side. Select the preffered length in the option field below. Microbore PCP airgun fill hose. 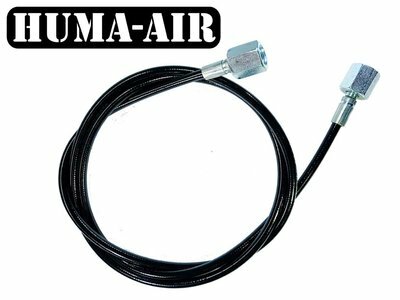 Our microbore fill hoses consists of a synthetic core with a 2 mm bore, inclosed by braided Aramid (Kevlar) fibers for extreme strength and a polyurethane finish. They are equipped with female 1/8 BSP couplers on both sides. Most rifles fill adapters can be screwed directly on the 1/8bsp connetion of the fill hose, or you can attach a foster female quick coupler to the fill hose what allows you to easy switch fill adapters from several rifles. Also check out our quick connect fill probes on our website. When you order accesoires or spareparts only, we use standard untracked shipping to reduce costs. If you prefer tracked shipping, you can choose "tracked shipping for spareparts" in the option field in the shopping basket. Good quality and nice length. 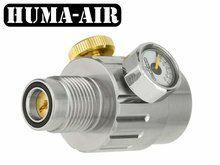 In combination with Huma-airs adjustable regulator, it makes it easy to shoot straight from the scuba tank.